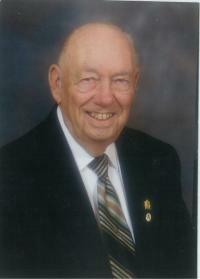 On Friday, January 20, 2012, Ed Brimacombe passed away at the U of A Hospital at the age of 87 years, surrounded by his family. Ed is survived by Betty – his loving wife of 59 years; daughter, Pat (Wolf) and their sons James and Rob; and son, Bruce (Judy) and their children Melanie, Alicia, Thomas, Andrew and Scott along with numerous relatives and friends. He was predeceased by his parents John and Ella and his brothers Stewart and Matt. Ed served in the RCAF Search and Rescue division for three years during WW11. He spent 31 years as a Driver Examiner, mostly in the Vegreville area. A Memorial Service will be held on Wednesday, January 25, 2012 at 2:00 pm at the Vegreville United Church with Reverend Ken Flanagan officiating. In lieu of flowers, memorial donations may be made to the Vegreville United Church or the charity of your choice.